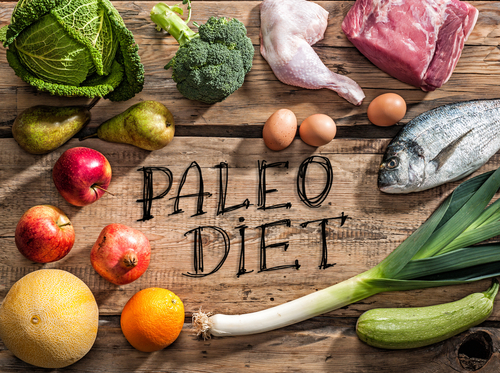 The Paleo Diet, is it a healthy option? I quite often get asked about my opinion on various diets as to how ‘healthy’ they are and recently quite a lot of enquiries re The Paleo Diet? I don’t follow The Paleo Diet but it has urged me to look a little closer at it in order to form an opinion. First and foremost, I don’t believe that diet is a case of one size fits all. Diet is a very individual thing which depends on biochemical makeup, lifestyle and what you are hoping to achieve with your health. So to start with, what is The Paleo Diet? It is a diet based on the types of foods eaten that our early ancestors would have eating, the thinking being that this is the way we were genetically designed to eat. In a nutshell this diet consists of lean meat, fish, vegetables and fruit and excludes dairy, grains, processed foods, salt, legumes including peanuts and alcohol. So what are the most obvious health benefits here? Good quality protein from meat, fish, nuts and seeds will support a good muscle mass, healthy bones and will boost the immune system. Fruit and vegetables provide a good source of fibre and they are rich in vitamins, minerals, antioxidants and phytonutrients which have been shown to reduce the likelihood of cancer, diabetes and alzheimer’s. Good fats from nuts, seeds, avocados, olive oil and oily fish are in the form of monosaturates and Omega 3 fatty acids which have been shown to reduce the risk of obesity, cancer, diabetes, heart disease and again alzheimer’s. So what if any are the draw backs? From a practical point of view, it is restrictive and therefore difficult to maintain long term. I can absolutely see the sense in cutting out gluten but cutting out all grain including rice and quinoa I personally would find difficult. Legumes too are excluded as they are supposed to inhibit the absorption of nutrients, so this would include beans, peas and lentils. In cases of IBS I feel it would make sense to cut out legumes to see if it helps, as they can trigger symptoms. Cutting out all grains would be beneficial in conditions such as autoimmunity where leaky gut may be playing a part, so sometimes this does make sense. Within the confines of this diet a balance of macro nutrients needs to be achieved. Government guidelines say that 50 to 55% of total calories should come from carbohydrate, 30 to 35% from fats and 12 to 20% from protein. These guidelines have not changed in years and it is a balance which has not served us well. Research suggests that the balance of macronutrients in our ancestors’ diets was likely to have been around 40% protein, 30% fat and 30% carbohydrate. I think achieving 30% carbohydrate may be difficult at times if relying solely on permissible fruit and vegetables in a paleo diet, but one which is important to achieve. Potatoes are not allowed nor are sweet potatoes in some versions of the paleo diet. My feeling is that sweet potatoes, squashes, turnip, parsnips really need to be included in a paleo diet to ensure that there is enough carbohydrate in the diet. It would be very easy for a paleo diet to become far too protein orientated. It is important to remember that protein is very acid forming and if it is not buffered by plenty of vegetables and fruit then your body will rob your bones of important minerals including calcium in order to redress the balance. This balance needs working at all the time. Some recipe books I have looked at suggest all protein breakfasts and this is simply not healthy. The quality of the meat and fish in a paleo diet is very important. Fish should preferably be wild and meat grass fed. Farmed fish is often polluted with mercury and eating animals fed on grains defeats the object of being on a paleo diet. Grass fed meat will contain more Omega 3 fatty acids and less saturated fat and if you are eating a lot of meat then this is very important consideration for health. This is not by any means a comprehensive review of a paleo diet but certainly food for thought. Even if you don’t follow a paleo diet to the letter I think we can take a lot of wisdom from it i.e.